One of the things people ask me about when I tell them that I don’t eat dairy, is “don’t you miss cheese?” – and to a lot of people’s disappointment, I tell them that I don’t. I was never really keen on cheese, but I know that a lot of people who stop eating dairy do miss it. 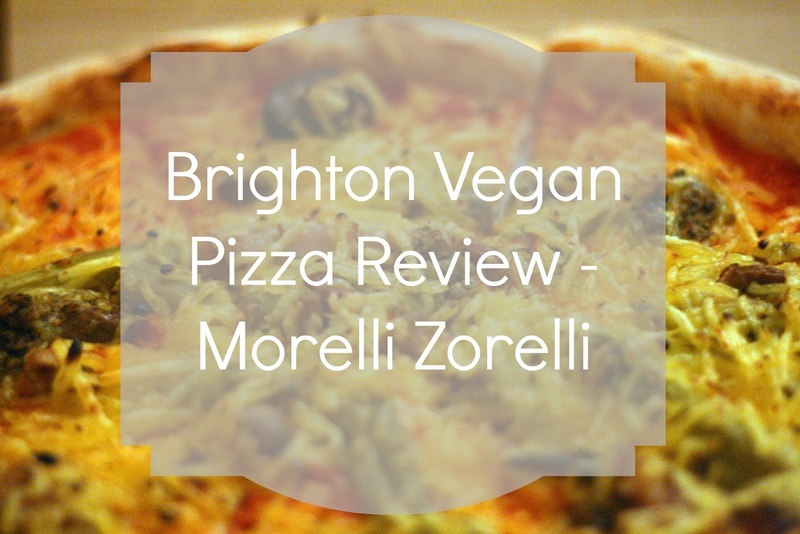 With that, and my love of pizza in mind, I thought I’d start a new series reviewing vegan pizza options in Brighton, with my first being Morelli Zorelli. Morelli Zorelli offer a selection of vegan pizzas, in both their standard 12 inch and their massive 20 inch. 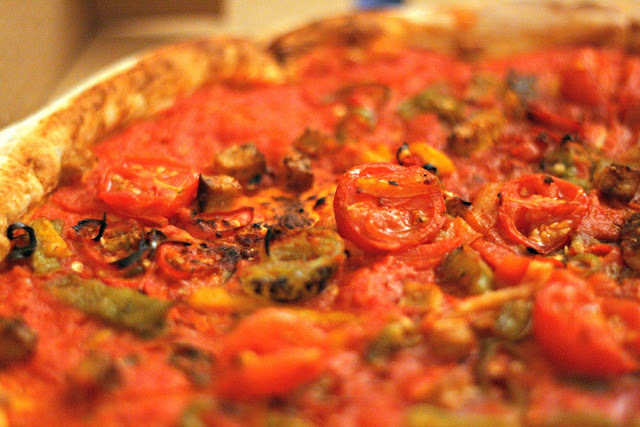 The majority of the pizzas feature mock meats, and a small selection have just veggies. As mentioned in my Vegfest post, I’m not keen on mock meat personally, but know that a lot of people do, which is why there’s a lot of offering at many pizza places which cater for vegetarian and vegan diets. I chose a basic cheese margherita pizza with some extra veggies (including asparagus, yum!) and the veggie hot with no cheese. 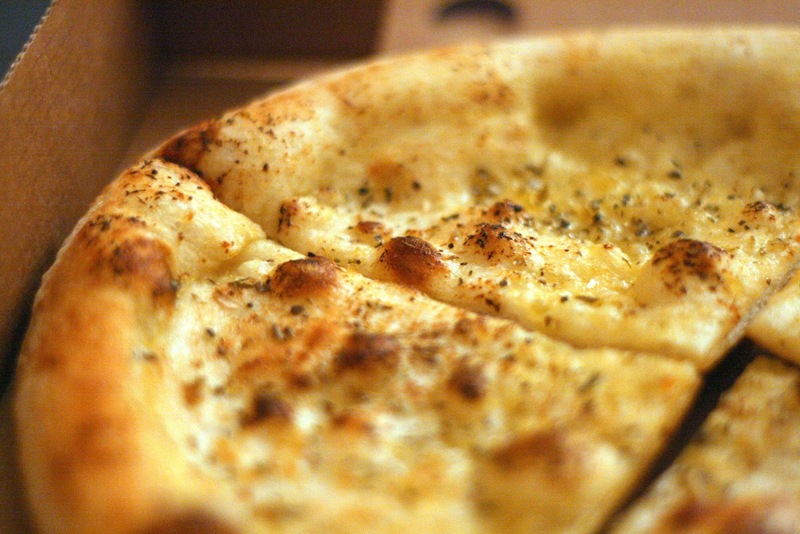 I also added some garlic bread to my order, because who doesn’t like garlic bread?! Like I said before, vegan cheese isn’t something I’m super keen on. However, the cheese on the pizza with cheese wasn’t too bad. It seemed to melt quite well, but there wasn’t that stringiness that dairy cheese holds. This seems to be one of the struggles that non-dairy cheese makers are dealing with and working on. I know that this will more than likely be an issue I encounter as I try more and more vegan pizza! The crust was good. I always worry about crust droop, but these two had been cooked in the pizza oven well, as had the garlic bread. Morelli Zorelli have a stone and flame oven, which is where they fire all of their pizzas and garlic bread in by the way! And if you were wondering about the vegan garlic bread? That was tasty, too. As well as vegan pizza, you can find the usual vegetarian and meat eater pizzas at Morelli Zorelli. Plus, they are also well known for their gluten free options. I kind of fancy one now. Pizza, anyone?! Thanks so much for Morelli Zorelli for providing me with the food to review for them. As with all reviews for Tea, Cake and Make, all reviews are honest impartial, and all my own words. Nom! That looks tasty! I've tried the gluten free version from Pizzaface and was pleasantly surprised, I think they do vegan options too. They're in both Brighton & Hove now. Who doesn't love a good pizza! I was never really keen on cheese either, but violife is totally my thing. This looks absolutely delicious, I wish they had a location near me! I've been seeing so many reviews for this place and it looks and sounds amazing.